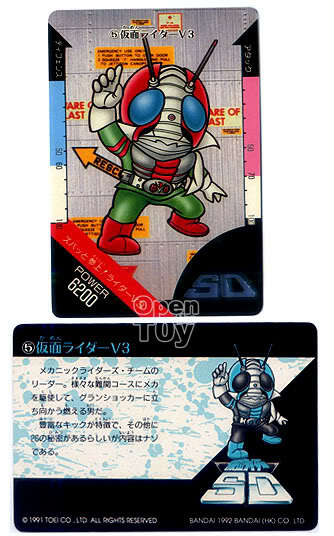 Here are a handful Kamen Rider trading cards I collected more than a decade ago. The cards were labeled in 1991. So that will be 18 years ago! They were from a anime which Kamen Rider were drawn as cute heroes. I have never seen the anime tho. I just use some pocket money out of curiosity. Each of them cost about $0.20 SGD when I got them. 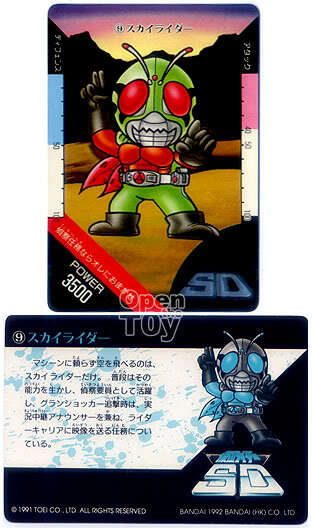 First off, it is Kamen Rider (aka Mask Rider) V3! The front was in portrait layout with some power level on both side. While at the back of the card written was a short bio of V3 in landscape layout. By the way, V3 is a Team Leader. Power level 6200! Next another Kamen Rider Sky Rider! Although Sky Rider only have 3500 power level, he is the only Rider that can fly. 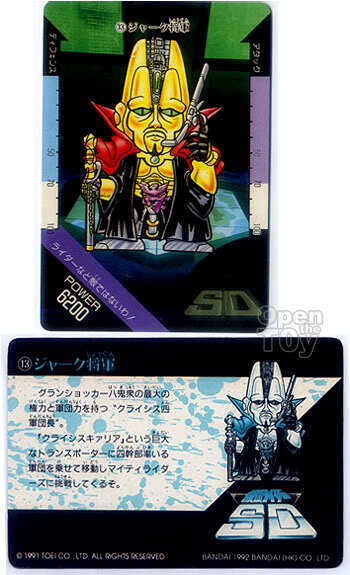 For the Villain, we have Jak Shougun, a military leader of the empire wearing a gold face mask which kind of remind me of the villain in G.I Joes. Although in SD mode, he doesn't look cute at all. Than again he is a Villain and his power level is on par with V3. How can Kamen Rider be a rider without a bike? Here's one for V3! Meet v3's hurricane. Power level only 4200 but the defensive power gave it an edge above the rest. Lastly the face off time. Black RX facing off with Shadow Moon. Power level 6800! More to attack than defense. 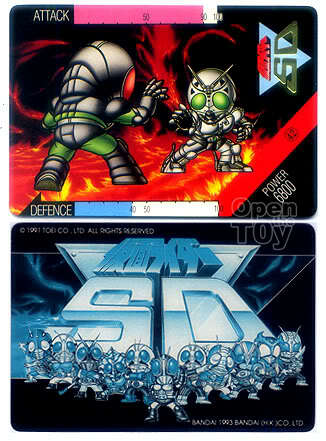 Looking at the back of the card above, let me think how many kamen rider I'm missing out in this series. I didn't collected the whole series as I had limited allowance during my school days. I sure would love to see the complete set. 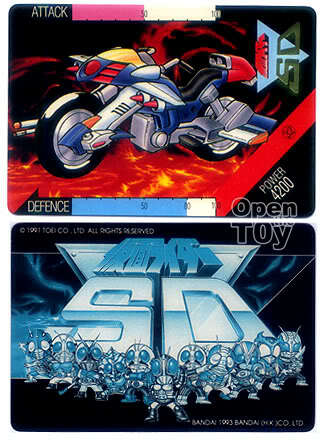 Anyone seen or collected these? For more of the anime information can be found here. I wonder anyone have watched the anime before. Local channel in Singapore never seems to air it. That's a cool looking cards. Did you play with it? Or did you simply just collect it? I wish I know how to play with it but that is just a handful I got for myself with the pocket money that I had.